Merry Christmas, and Presents Too! It’s been a while since I started doing (and finished up) regular Fashion Forecasts here...and one corollary of that is that I’ve since acquired a lot more prints for any given year. Since the last time we looked at fashions in the year 1810 was back in 2009, I thought I’d post some more prints from my collection...because, eye candy. 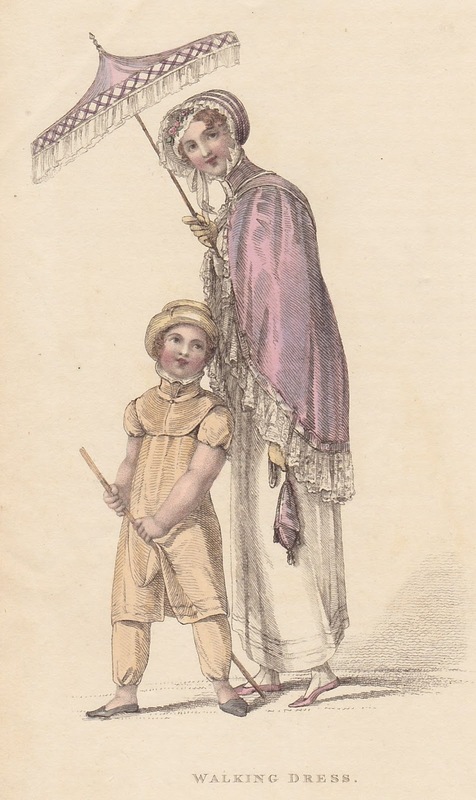 1810 was the year of the child, at least as far as Ackermann’s Repository was concerned: this particular year features multiple images of children, which gives us a nice look at what the fashionable child was wearing...in this instance, from January, not all the much (someone give that child a sweater!) Mom’s Evening Dress looks much warmer. 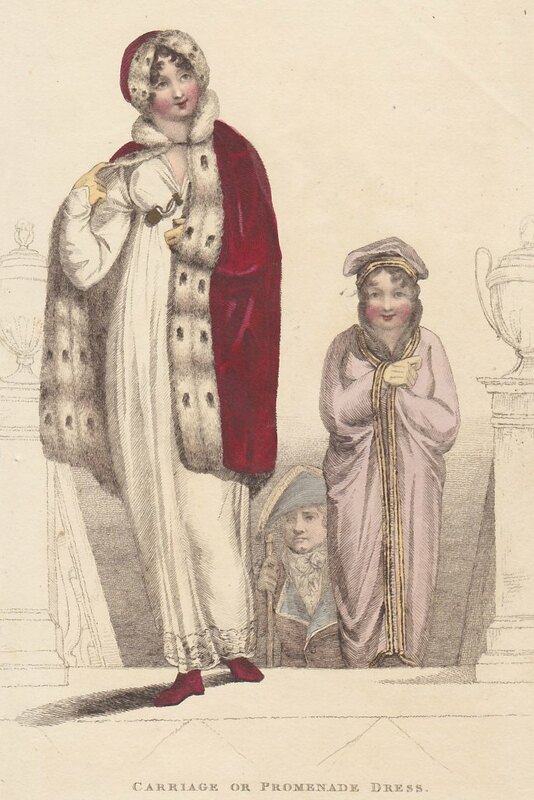 My oh my, the fur-lined cloak in this Carriage or Promenade Dress from January looks cozy! Another fur-lined cloak in February’s Opera Dress—perhaps because there was no central heating in theatres. Note her opera glass in one hand, the quizzing glass around her neck, and a copy of the libretto in her hand (at least, I am assuming that’s what it is). 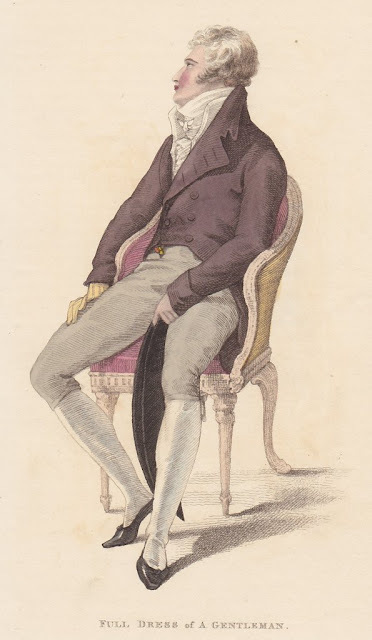 Full Dress.—Superfine corbeau colour coat, with covered buttons; white Marcella waistcoat, single-breasted; light sage green, or cream-coloured kerseymere breeches; also those of black florentine silk are very fashionable and consistent in this style of dress. Dark blue coats, with plain gilt buttons, are likewise considered fashionable. 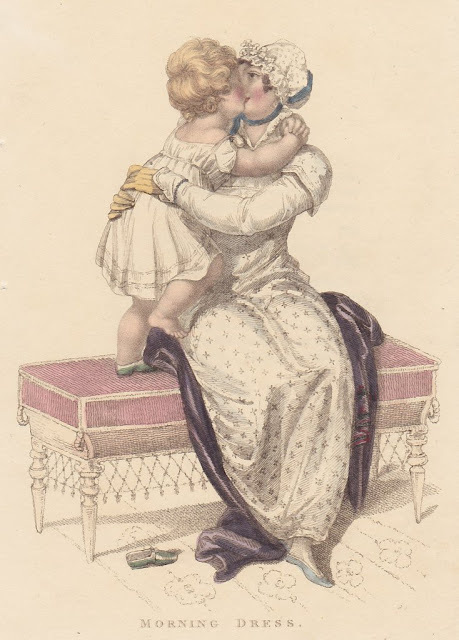 The cravat is still worn high and full. April’s Walking Dress is truly multinational, if you read the description! It always surprises me that even though they’d been at war for decades, French fashions were still all the rage in England. 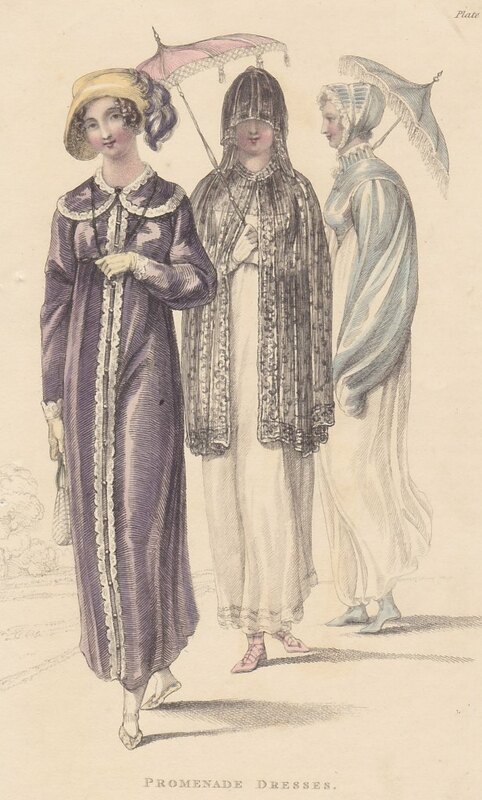 A round high robe of French cambric, with Armenian collar, and cuffs edged with narrow antique lace; three rows of appliquéd lace beading round the bottom. An Egyptian mantle of lilac shot sarsnet, trimmed with broad Spanish binding, and deep thread lace. A Parisian bonnet of the same material, ornamented with narrow stripes of white satin ribbon, and trimmed at the edge with lace, or a plaiting of French net. A small French cap, and flowers appearing in front of the forehead. Chinese parasol, with deep awning of white silk. Ridicule to correspond. Lilac kid slippers or half-boots. York tan gloves. 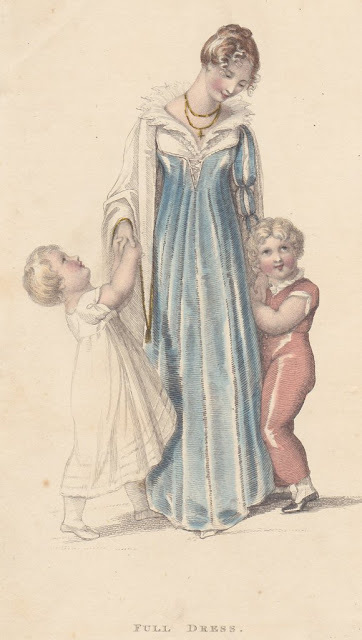 Child’s dress of nankeen or buff kerseymere, of the Highland order. A three-fer! July’s Promenade Dresses are interesting: in particular, the purple one reminds me of dresses one hundred years in the future, ca. World War I. The veil in the middle dress is, er, interesting. 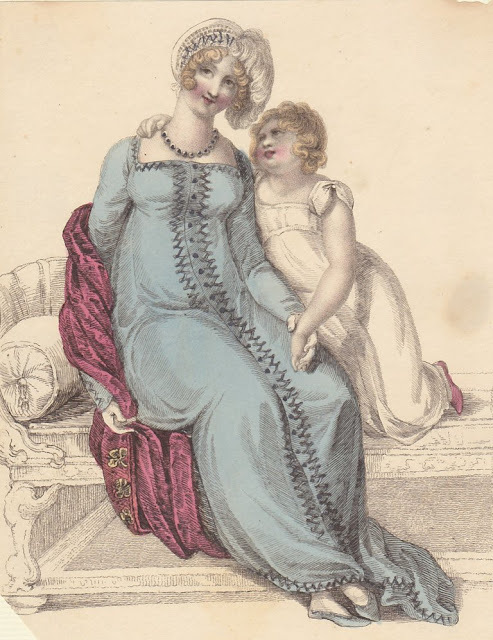 Mom’s Full Dress (September) is very Renaissance inspired, with the slashed sleeves, broad, framing collar, and lacing in the bodice. The children’s clothing is charming, I think. 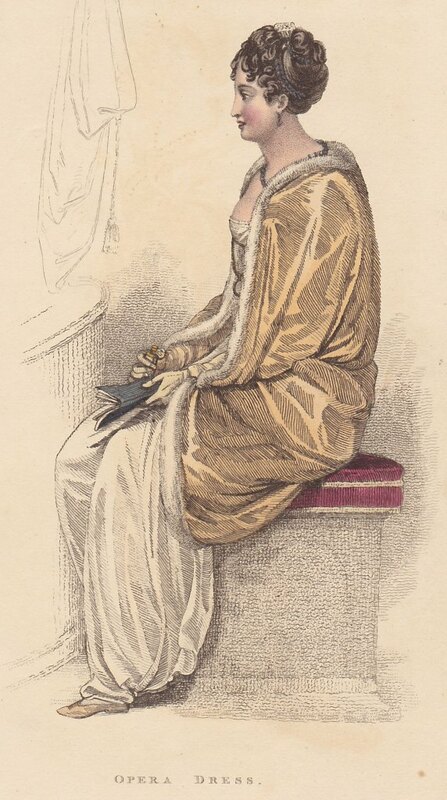 A plain cambric high gown, with surplice sleeves, and van dyke border round the throat. A Spanish robe of pea-green muslin, crape, or sarsnet, bordered with cable trimming, and buttoned to the shape in front. A winged mob cap, composed of white crape and beading. A bee-hive bonnet of fine moss or plaited straw, ornamented with white sarsnet ribbon. Limeric gloves, and Spanish slippers of sea-green kid. What I’ve loved about the fashions of 1810 is that they’re different and interesting—not all alike (1820-22, I’m looking at you)—the Full Dress looked nothing like the Promenade Dresses, which look nothing like this Evening or Half Dress, with its embroidered bodice and hem and an embroidered Indian shawl. I rather like the blue one with the slashed sleeves. The rest are just sort of Meh to me at the moment. I like them all a lot. The children's clothes are charming. It's nice to see children shown in fashion plates. 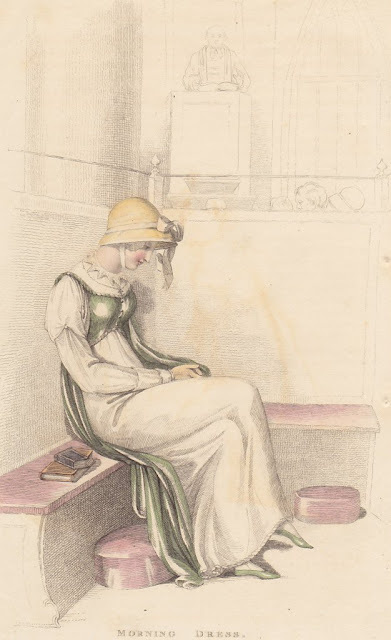 However, I would stick to the 18th century styles and be hopelessly dowdy because those slim, column shaped dresses just would not suit me.